We know you’re excited to get your HIPAA compliant email set up on your devices and computers. Using these page, we’ll answer for you the maximum file size allowed per email sent. 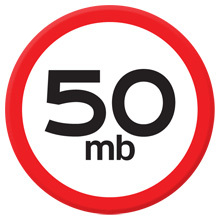 There is a 50MB size limit for each email sent via Paubox Encrypted Email. If you send an attachment larger than 50MB via Paubox Encrypted Email, it will bounce back to you as an undeliverable message. If you need to send a larger file, simply upload it to Paubox. You can either share the folder and require a login or send it as an encrypted link.